Don’t make a spectacle of yourself, the dramatics of the circumstances are not worth the commotion. Why are we so compelled to engage in the theatrics of someone else’s ‘stuff’? What intimidating force takes over us like a constraining pressure which seems to bludgeon our will to complain? The negativity seems to squeeze itself out of our mouth, almost against our will, at times we realize what we are doing but we can’t stop! Drama is like a hallucinogenic drug, the more you feed into it, the more irrational and profoundly distorted your mind becomes. Drama is no different from any other addiction, once you engage, once you say that first word, or make that first gesture with your eyes, you are hooked in. People will go to great lengths to get a drama fix and the symptoms and side effects are innumerable. Loud indecent voices, greasy body language, mean and nasty dialogue, all of this comes with a shower of negative energy that could easily drown a 100 people at one time. There is something grossly despicable about a human who seemingly will thrive on someone else’s despair and discouragement. What exactly does the perpetrator get out of ditching, slandering and damaging another humans earthy experience, aren’t we all here on a similar journey, all of us just trying to stay on our path the best that we can? Why is dramatizing and tarnishing another persons Soul so important to so many? There is so much irony in all of it. The paradox is seemingly absurd and self-contradictory because those who gossip are exactly those same people who are being gossiped about. 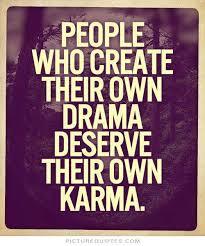 Negative energy attracts negative energy, so if you are one of those people who have the terrible addition called ‘Drama’, rest be sured that there are many, many others in ‘your tribe’ that are dependent on your actions, your choices and your life’s journey, as a substance to feed their own habitual obsession to drama. Take a good look at yourself, because what you will see in the mirror is exactly what is reflecting back at you in your own life. Being an addict to drama will rob you of your own Souls growth, what a shame to waste such a beautiful opportunity in this life time because you didn’t have the guts to kick a really distasteful and disgusting habit.